There are recipes with cauliflower but not like this Warm Cauliflower Bacon Salad topped with a luscious buttery hot apple cider vinaigrette. This cauliflower salad IS the best cauliflower salad recipe for the upcoming seasons and we’re sharing the recipe with you today. This warm cauliflower salad is so good that my wife ate the entire dish before touching her meal. She said it was just so hard to stop eating it because the cauliflower and bacon pair up so nice together. It’s true. Finally cauliflower is reasonably priced. Cauliflower has dropped in price from $8.00 a head to $0.88 on sale at grocery stores and farmers markets across Canada. The winter will bring a spike in price for cauliflower and other imported vegetables because of the Ontario climate but don’t be afraid to add it to your grocery list. Cauliflower is very nutritious. 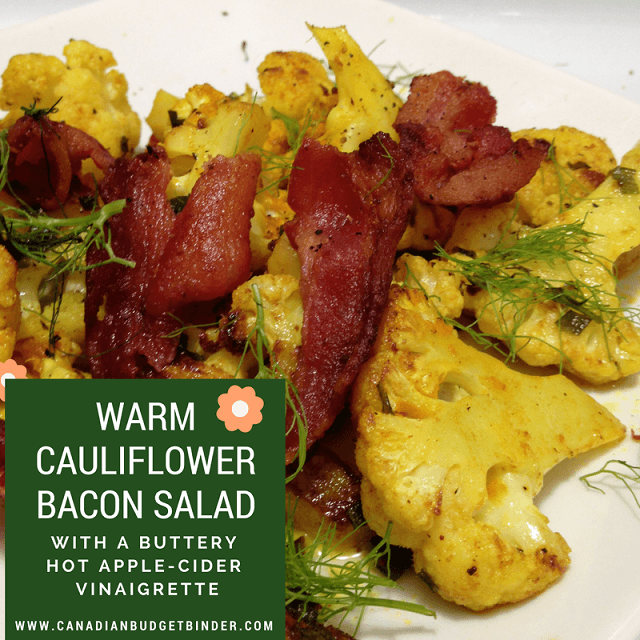 This cauliflower bacon salad is perfect for Autumn and Winter or even serve it at Thanksgiving or Christmas dinner as a side-dish. My wife enjoys a low-carb lifestyle which means our son and I also enjoy the odd recipes with her because they are that delicious. The low-carb high fat diet is about eating fat to lose fat which means you eliminate sugar and most carbs from your diet. My wife loves this way of eating and it’s amazing how well she is doing and her health is great according to the doctor. If you don’t care to saute the cauliflower in butter you can toss it in some olive oil and roast it on the grill or in the oven as an alternative. When you add our wonderful apple cider vinaigrette to the cauliflower and bacon salad it will soak into the cauliflower like a sponge. This recipe is is simple to make, inexpensive (for now) and it’s unique. The stove-top fried cauliflower takes minutes to cook up in butter and covered with a lid. We’ve eaten lots of cauliflower over the past year and the best way to prepare cauliflower is to bake it, saute it or grill it hands down. The only spices added to this cauliflower recipe are salt, pepper, turmeric and dried or fresh chives depending on what we have on hand. Once you heat the butter up and add the cauliflower it browns up fast but keep an eye on it and stir often. Put the lid on your frying pan as this helps soften the inside of the cauliflower just a bit. You will want the texture of the cauliflower to be a bit crunchy but easy to bite into. 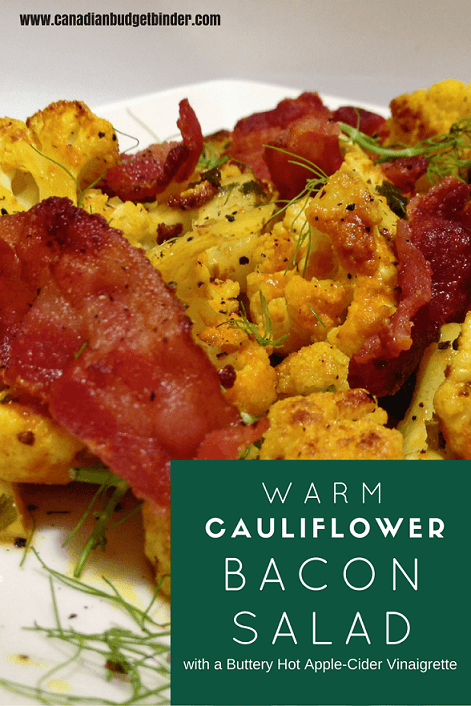 I like to cook my bacon ahead of time rather mixed in with the cauliflower for presentation purposes and I don’t want the cauliflower to take on the taste of the bacon. Another one of our secrets…shh! My wife and I have cooked up so much bacon since she started the Atkins way of eating and we’ve officially come up with the easiest and best way to cook flavourful, colorful, crispy bacon every time. We’ve tried the oven, microwave and convection counter-top oven and the best is always in the frying pan or griddle. You must freeze your bacon and when you are ready to cook your bacon unwrap it and put the entire frozen slab of bacon into the frying pan on medium heat and cover it. Once the moisture from the ice in the bacon starts to accumulate and soften the bacon use two forks or a fork and spoon and start peeling each strip off one by one. You will want to use a big frying pan or griddle to do this so you have room for all of your bacon. It’s important to line your bacon strips up nice and neat and to continue cooking the bacon on medium heat even if water and juices accumulate in the pan. Every few minutes flip the bacon over and continue to do so until the bacon is that amazing bacon colour and crispy on both sides. You don’t want to have any chewy bits left on the bacon as it makes it tough to eat in the warm cauliflower bacon salad. Our son also prefers to eat bacon crispy since he doesn’t have all of his teeth yet so it becomes a struggle for him and a choking hazard. I don’t want the Bacon paparazzi coming after me so keep my bacon trick a secret. The dressing for the warm cauliflower bacon salad is fairly simple to make. Once you remove your cauliflower from the pan leave the heat on the stove and the frying pan on. If you notice there isn’t much melted butter left in the pan after frying the cauliflower add 1 teaspoon to the pan to heat up. You can also add the equivalent of bacon fat to the pan as well or half and half for optimal flavouring. Once the butter is melted add 1-2 tablespoons of apple cider vinegar to the hot butter and stir it all up. You will want to pour the dressing over the cauliflower as soon as possible along with large pieces of bacon. I simply snapped the crispy bacon in half and put it on top of the cauliflower. 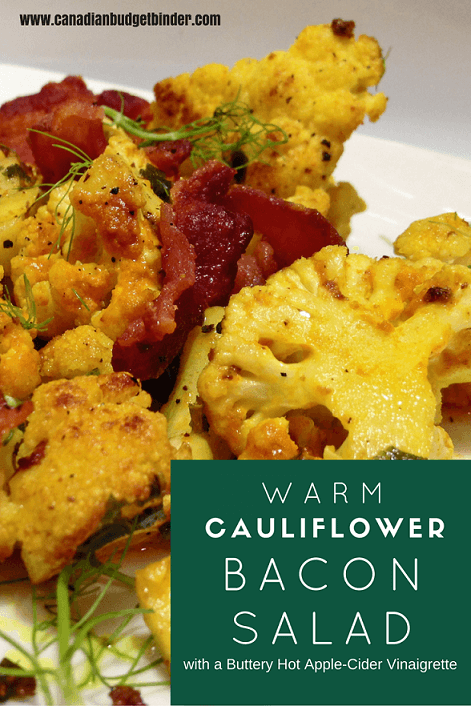 Mix the warm cauliflower bacon salad and serve immediately as a side with your meal or as a meal. I’ve tried the cauliflower bacon salad cold and it’s just as delicious so don’t worry if you have leftovers for the next day. This simple cauliflower recipe will take you about 30 minutes tops to make it from start to finish including the bacon prep time. 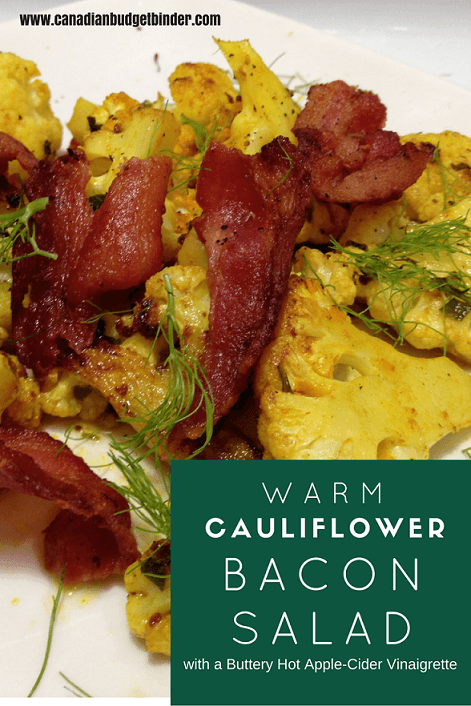 Add something new to your menu this season and make it this warm cauliflower bacon salad. You won’t regret it. Cauliflower is good for you and very nutritious. Cauliflower is a wonderful vegetable to create this warm salad that is dressed with an amazing dressing that will make your mouth sing. The apple cider vinegar, butter, bacon and cauliflower all fit together nicely in this inexpensive simple dish. In a large frying pan on medium heat add your slab of frozen bacon and cover. After a few minutes using 2 forks start to gently peel away the strips of bacon and align them perfectly in your pan. Every 2 minutes use a fork and flip your bacon gently until all strips are perfectly cooked on both sides and crispy but not burnt then set aside on paper towel. In another frying pan add your 2 tablespoons of butter to melt then add your cauliflower florets and cover with a lid. After 3 minutes take the lid off and add your salt, pepper, chives and turmeric. Allow the cauliflower to brown on all sides without burning it. Keep the pan with butter so if it dries out add a bit more or some bacon fat. Once the cauliflower has some dark colour remove it from the frying pan and add to a serving dish. With the remainder of the butter in the pan you can add a tablespoon more so there is at least 2 tablespoons of butter in your pan, add salt and pepper to taste and apple cider vinegar then gently stir for a minute to combine. Pour the hot buttery dressing over the cauliflower, then add your bacon halves and serve hot. I served the cauliflower bacon salad on a flat plate and added some fennel greens for colour and flavour although this is optional. Enjoy your vegetables!